It’s hard to beat a toasted sandwich when you fancy a hot, satisfying snack. Happily, the latest sandwich toasters ensure it's quicker and easier than ever to whip up a scrumptious toastie. Take the popular Breville VST041 Deep Fill Sandwich Toaster, a sleek graphite and stainless-steel model that makes a handsome addition to any kitchen. As Breville’s deepest fill sandwich toaster, the VST041 allows you to get more creative with your toasties and cram in more delicious fillings than ever. And when you’ve assembled your culinary masterpiece, you won’t have to wait long before your perfectly toasted sandwich is ready to be devoured – the VST041 delivers top-notch toasting in a matter of minutes. As any toastie connoisseur knows the perfect toasted sandwich is perfectly sealed and sliced. Luckily, Breville’s Cut & Seal system slices each sandwich in half and seals it to contain all the filling, so sloppy, leaking toasties will be a thing of the past! Even better, cleaning up is effortless thanks to non-stick plates that can be easily removed and placed in the dishwasher. 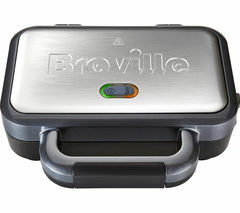 Breville’s dedication to toasted snacks doesn’t end with the toastesd sandwich. The VST025 Cafe-Style Sandwich Press enables you to rustle up perfect café-style paninis in your own kitchen and features the same smart, durable design quality you’ve come to expect from Breville. You can even use it to toast focaccia and ciabatta. 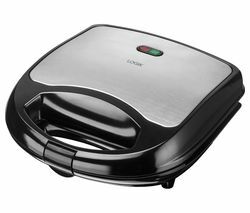 Our selection of sandwich toasters also feature the latest models from leading brands like Russell Hobbs and Logik. And if you’re expending your search for the latest kitchen gadgets and appliances, make sure you check out our George Foreman grill collection and view all slow cookers from the likes of Crock-Pot and Morphy Richards.